Seattle Opera Blog: BIKE TO THE OPERA--this Sunday! BIKE TO THE OPERA--this Sunday! Seattle Opera invites and encourages ticket-holders to the Sunday, August 14 matinee performance of Porgy and Bess to BIKE TO THE OPERA! Enjoy a beautiful Seattle summer day, avoid the traffic, and have fun with other opera-goers by riding your bike to our sold-out, 2 pm matinee performance of Gershwin’s masterpiece. Dress as you like, or bring something to change into when you arrive at McCaw Hall. So that Seattle Center can prepare an appropriate number of bike racks, we'd appreciate it if you'd RSVP that you’ll be biking to the show at http://goo.gl/WyiI2. Thanks! 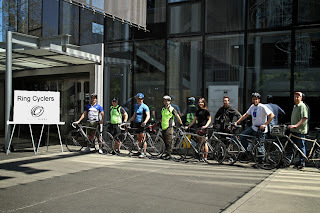 Photo of Seattle Opera’s Bike-To-Work Team, the Ring Cyclers, by Alan Alabastro. Hallo, Jon & Others with this great idea!!!! SeaOp comes up with a great idea a day, it seems!!! Another great idea would have been to have (at least) two matinees of "Porgy & Bess"; as you see, one sells out completely!!! Many, like myself, prefer to come to matinees -- for travel reasons and because we seniors feel safer going to and FROM matinees, though I go to both, as SeaOp productions are sooooo good I want to see them more than only once, especially when there are two casts (the "silver" is often just as good as the "gold"!!!!)!! It was a great day to ride to the Opera (traffic was terrible, weather was great) I'm so glad we did!